Tanya Goel, Field, notation (2/1), 2015, 274 x 213cm. Courtesy Nature Morte. Construction sites, although a temporary stage of building, maintain a permanent presence in cities. Arguably a defining feature of cities, they denote the constant overturn of public and private spaces as new governments, priorities and stylistic tastes come into power. A taxi driver in Manila once joked to me that their national bird was the crane. These half completed sites are barely noticeable to city people, no matter how much scaffolding and loud machinery adorns them. Artist Tanya Goel notices them on our behalf. These sites are the first stage of development for her painting practice. Tanya Goel, Fresco on Marble (detail), 2015, dimensions variable. Courtesy Nature Morte. Goel employs materials found at construction sites in her home city of New Delhi to examine how our spatial relationships are curated by the cities we inhabit. Goel’s interest in the grid motif stems from her time in North America, where the physical adjustment to the layout of Western cities required a significant mental adjustment. The Cartesian grid system of Chicago, Brooklyn and New York was highly disruptive to Goel, who was used to New Delhi’s more circular layout. Diagonals were suddenly ‘obliterated from one’s consciousness’ (1) and right angles became much more prominent in how she moved between spaces. These perceptions are addressed in Goel’s ‘frescoes’, found fragments of concrete, marble, cement and stone. These irregular shaped bits of buildings are shown pinned to white gallery walls like collected specimens, with miniature grids imposed on their flattest surface in incongruously bright pigment. These fragments, removed from their original location and purpose, highlight how our surroundings shape our spatial relationships and allow a point of disruption to the grid system Western cities are built from. After time spent in Chicago, Brooklyn and New York, Goel returned to her home city of New Delhi in 2012 to find it a very different place. The demolition of mid-century modernist buildings in favour of high rises was amplified for Goel due to her absence. Goel works through this adjustment by resourcefully collecting materials gleaned from demolition sites and reconfiguring them onto meticulously gridded canvases. This inventive approach is time intensive, with each found material (brick, ash, limestone, dust) finely ground and combined with oil or acrylic binders to form paint. The labour and patience involved underlines a genuine respect for the materials that once formed the city itself. There is an uncompromising commitment to reuse, to see the utility in the remnants. Goel also includes sparing hints of bright orange pigment in these largely chromatic grey grid paintings, as a disruption to the subdued colour scheme as well as an ‘aberration to the grid’. (2) The inclusion of the orange is informed by its nomenclature, (3) as the word orange does not rhyme with anything in the English language, making it an outlier. Goel’s attention to materials that deviate from the norm, even in linguistic terms, reinforces her undercurrent drive to disrupt order and subvert systems. Goel’s grid paintings and frescoes resemble pixelated images or physical glitches, linking her interest in how screens are ‘surfaces that mimic light, absorb attention and distract the eye’ and the ‘duration of an image’. (4) Goel responds to our current fast-paced mode of viewing images by methodically arranging found materials into repetitive patterns, suspending our looking without providing a focal point. Instead of the usual bright LCD screens, Goel cleverly has us transfixed by dirt, rubble and earth. Like the construction sites that are so common as to be unnoticeable, the practice of routinely skimming over familiar sights for visual efficiency is a symptom of the quickened pace of city life. Again, Goel’s works quietly interrupt the routine, slowing us down and keeping our attention on the micro materials that make up temporary macro structures. Goel’s works are a rich response to how cities shape us and how to deal with their constantly shifting state. Her works archive a brief moment in her home city’s history, mid-transition. Mud maps for places you can’t return to twice. 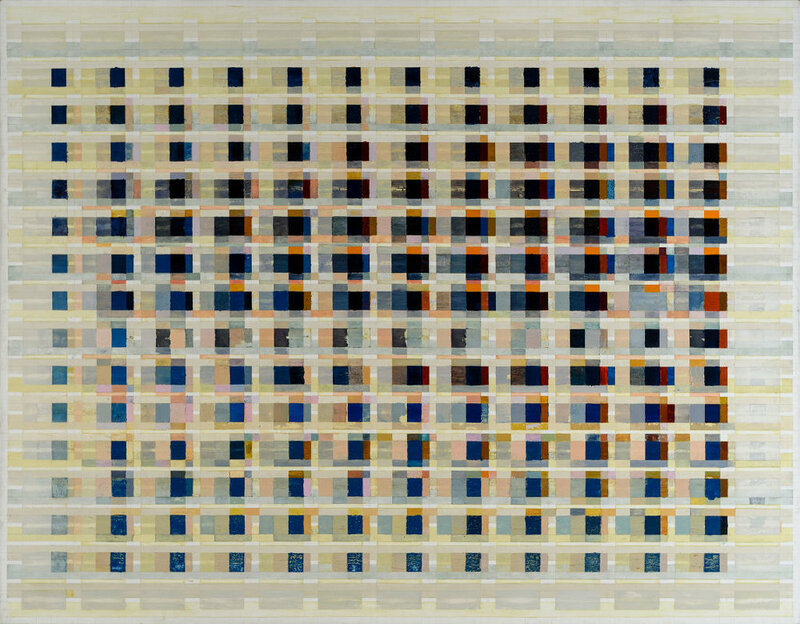 Tanya Goel, Field data (in dots per inch), 2016, 274 x 213cm. Courtesy Nature Morte. Nicole Clift is an emerging artist and arts writer in Adelaide, South Australia.